Build a bee hotel as simple or as elaborate as you wish to help attract native bees to pollinate your garden. Native bees are solitary but communal. They will live in close proximity but prefer their own space for nesting. Unlike honeybees, native bees are solitary. The female bees lay their eggs in holes in trees and wood or in the ground. You can attract more native bees to your garden by building a bee hotel to make finding a home much easier for the bees, who happily pay their rent by pollinating your plants. Your bee hotel can be as simple or as elaborate as you want. They come in all shapes and sizes, limited only by your imagination. The easiest is to get a simple square block of wood at least 8-10 inches deep. Be sure to use untreated lumber. Treated lumber contains toxins that can be harmful to bees. For mason bees, drill holes at least 6 inches deep. For other bees, drill holes between 2½-4 inches deep. The holes should be about one-quarter of an inch wide. Blocks should be placed at least 3 feet above the ground and erected in early spring. Face them southeast in the shade, preferably under eaves or any structure that will protect them from the rain. Blocks can be mounted on the side of a house or shed or attached to a fence post. 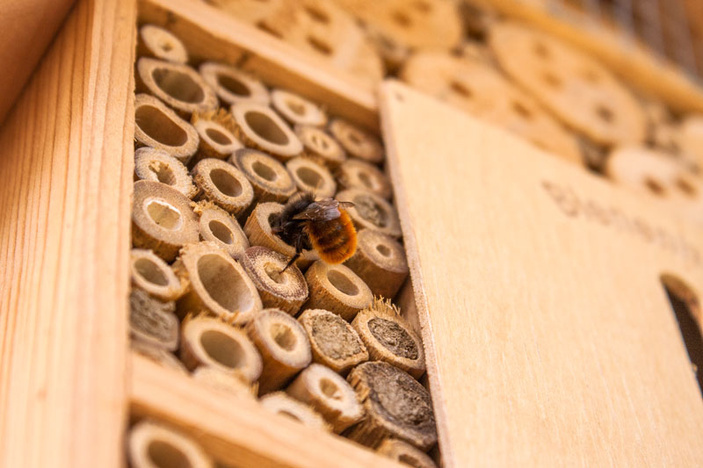 For a more exotic bee hotel, build a frame or box that can hold a variety of logs, branches, and other pieces of wood. Arranged within the framework, the wooden sticks blend naturally into your garden. By the way, the framework must be enclosed at the back and open in the front. Slope a roof over the cube, extending an edge out about 2 inches to protect the bees from weather. All holes should be at least 6 inches deep to give the bees rooms to nest. Use different sized drill bits for a variety of holes. About halfway through drilling each hole, reverse the drill to prevent sawdust buildup. You can paint or seal the frame, but the bees will not be want to live there until after the smell has worn off, which could be several weeks. You can cover the front face with chicken wire to prevent pieces from falling out. When drilling the holes into branches contained in a framed bee hotel, make the holes different sizes, varying in diameter from one-eighth of an inch to a half inch. They should be spaced about one-half inch to three-quarters of an inch apart. Holes larger than one-quarter of an inch should be 5-6 inches deep. Holes one-quarter of an inch or smaller should be 3-5 inches deep. Once drilled, smooth out the ends of the wood with sandpaper. Small-diameter pieces of bamboo, plastic tubing, or hollow reeds all cut to the same length as the branches and logs are good fillers. Like the blocks of wood, these more elaborate bee hotels can be mounted on a fence post, an exterior wall, or any vertical surface using screws through the rear wall. The structures should be about chest high, facing south. The warmth from a south-facing bee hotel gives the insects a longer egg-laying season in both spring and fall. Bees nest through the winter, hatching in the spring to pollinate and procreate. Once the rooms that were sealed all winter have broken open and the bees have left, you should replace them with new material. That keeps the bees from transmitting diseases.